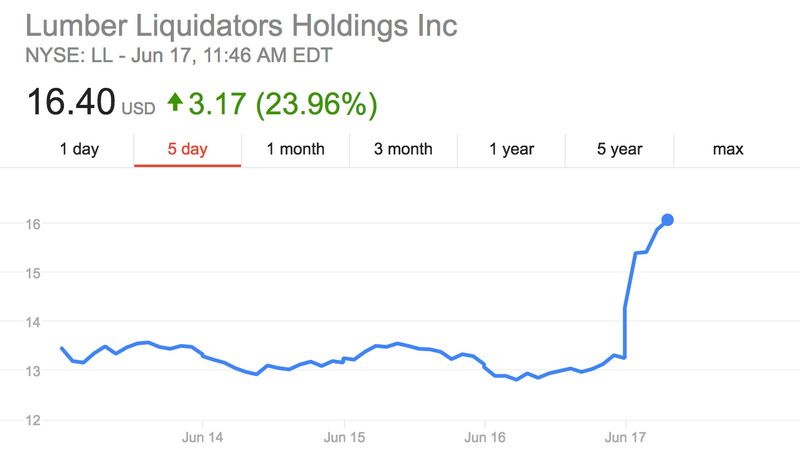 Lumber Liquidators is finally getting some good news, and investors may be taking it to heart. The lumber provider received a ruling from the Consumer Product Safety Commission that some of its flooring from China had heightened levels of formaldehyde, but not enough to hit the remediation level. This ends the government’s investigation into the firm. This means that a full-scale recall of all the flooring associated with the investigation is not necessary, saving the firm bundles of money. Lumber Liquidators has been under fire for almost two years after a “60 Minutes” investigation found that some of the home improvement company’s flooring had levels of formaldehyde higher than air quality regulations in California allowed. Increased levels of formaldehyde have been linked to an increased risk of cancer. This lead to a disastrous tumble for the company’s business and stock, and prominent investors began to bet against the firm. The CSPC also announced that the firm could not sell any of the contaminated flooring and would work with the agency to find a proper way of disposing with the materials. Additionally, any consumer with impacted Lumber Liquidators flooring in their homes can contact the firm for a free test kit to ensure their safety. 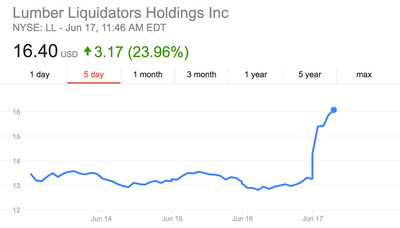 In reaction to the news, Lumber Liquidators shares spiked over 20%. As of 11:44 a.m. the stock was up $3.07 a share, roughly 23%, at $16.30.